Monica Youn, an attorney in the Democracy Program of NYU's nonpartisan Brennan Center for Justice, presents this study of Judge Sonia Sotomayor's record. 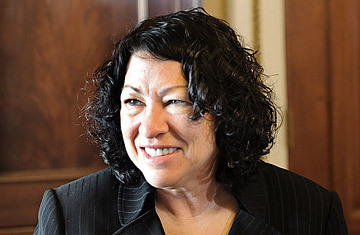 To contextualize Sotomayor's decisions and inform the ongoing debate over the U.S. Supreme Court nominee's purported history of "judicial activism," Youn looked at every constitutional case  1,194 in total  decided by the judges of the Second Circuit U.S. Court of Appeals during Sotomayor's decade of service. The study used three major measures: whether the votes of each judge were in accord with his or her colleagues'; how often the judge upheld the action of another government branch; and how often the judge deferred to the lower court or agency decision under review.  How Sotomayor compares to her colleagues: "In general, judges in the Second Circuit almost always ruled unanimously  in 93% of decisions. They voted to overturn the challenged governmental action in about 1 out of every 6 constitutional cases. In over one-third of those cases, they voted to overturn the lower court or agency's decision ... Judge Sotomayor's constitutional decisions closely conformed to the overall Second Circuit profile with respect to all three indicators."  Sotomayor's record on civil rights cases: "Judge Sotomayor joined unanimous decisions in civil rights cases in 89.1% of cases, compared to the circuit rate of 90.6% unanimity. She dissented in only two cases out of her 46 civil rights cases (4.3%) in the Constitutional Dataset, as compared to a 2.7% dissent rate for such cases in the circuit overall ... [She] voted to hold the challenged governmental action unconstitutional in 23.9% of cases, slightly more often than the Second Circuit overturn rate of 20.6% in such cases. However, she voted to overrule a lower court or agency determination in civil rights cases in only 43.5% of her decisions, less frequently than the circuit's 50.9% overrule rate."  Sotomayor on First Amendment cases: "Judge Sotomayor was part of a unanimous panel in 94.1% of the First Amendment cases in which she participated, more frequently than the Circuit's rate of 90.9%. She dissented in only 3 of her 68 First Amendment cases, or in less than 5% of these decisions. Additionally, in cases involving a First Amendment claim, Judge Sotomayor voted to overturn the challenged action in 25% of the time, slightly more than the Second Circuit rate of 24%. However, Judge Sotomayor voted to overturn the lower court or agency's decision less frequently than the circuit average  in 36.8% of her decisions as opposed to a circuit rate of 43.8%." Youn finds that "fears that Judge Sotomayor is an 'activist' or 'outlier' or 'out of the mainstream' have no basis in her record of constitutional cases." Instead, Youn argues, her judicial profile is "very much in line with her colleagues." The study gives a brief overview of the term "judicial activism" and explains how it has been saddled with negative connotations since Marbury v. Madison established the court's power of judicial review in 1803. Specifics of the cases reviewed aren't available in the report, but the study nonetheless paints a good statistical portrait of what might be expected if Sonia Sotomayor is confirmed as a Supreme Court Justice. Read "Inside the Moderately Liberal Mind of Sonia Sotomayor."